Fire Jugglers shot with camera supported on HandlePod. The worst thing about using a tripod is it slows you down. The best thing about a tripod is it slows you down. Both statements are true depending on your approach to photography and what you are trying to do. A tripod makes you think more carefully about the photograph—composition, exposure settings, focus. It is a more contemplative, involving process that can yield better results. If time is not an issue, then a tripod is an essential piece of equipment for low light night photography. But what if your time is limited? What if you are on a tour or traveling with a companion who is in more of a hurry-up mode than you are? Setting up a tripod might not be the best approach in that situation. In that case, a pocket size tripod alternative like HandlePod is the better choice. Lightweight, fast and easy to use, it can save the shot when a tripod is unavailable, inconvenient, or prohibited. 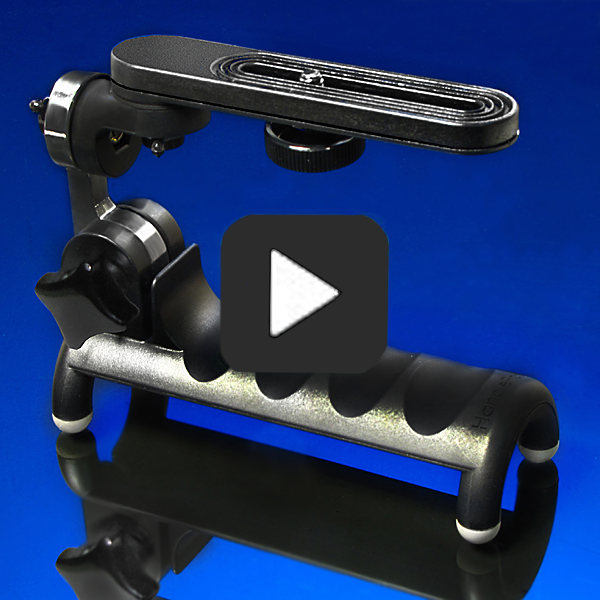 HandlePod folds compactly under the camera, ready for instant use. Speed is a major advantage of HandlePod. Keep it folded on the bottom of the camera ready for instant use. When needed, fold it out, press it against any convenient support and shoot. Be sure to use a remote release or a two second timer to avoid camera vibration. Used correctly, HandlePod yields tripod solid exposures of any length that are free of camera shake. Manual exposure and manual focus are best for night photography. Establish a basic exposure for the lighting situation then make adjustments for each shot. Since cameras have a difficult time accurately measuring night illumination it is best to bracket exposure times over several stops. Keep the ISO setting low to minimize grain. It is best to focus manually since auto focus is less than reliable in low light. Color balance should also be pre set though auto white can work very well. Here it is possible to experiment with different settings. Start with Tungsten and go from there to see what works best. By pre-setting the camera and having the HandlePod attached and ready to go, you will be able to shoot quickly. You can take advantage of low light photography that would take considerably more time using a tripod. And you are able to travel light with a minimum of weight and bulk. This entry was posted in Camera Stabalization, Low Light Photography, Tripod Alternative on March 29, 2015 by main user.